They claim they give “more latitude, more speed and more safety”. 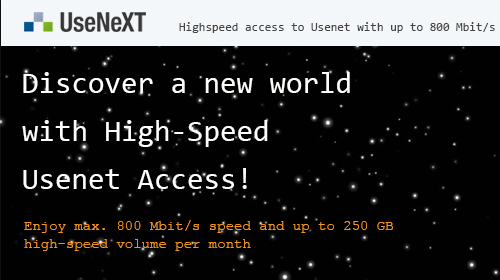 UseNeXT offers 99.9% completion and very high retention rates of 3,832 days for text and 2,013 days for binary. With 256-bit SSL encryption, free of ads and spyware and fast downloads at full bandwidth and 30 simultaneous connections, they prove to have lots of features. All of these features show that the company really wants to give the best experience. If you are unsure what exactly is “Usenet” they have a full page on their website explaining the pros of Usenet and how to use it. They also have a discussion board with active posts about all things Usenet for members. They offer a 14-day free trial with up to 300GB download. It is available for all new members and you can cancel at anytime during the free trial period. 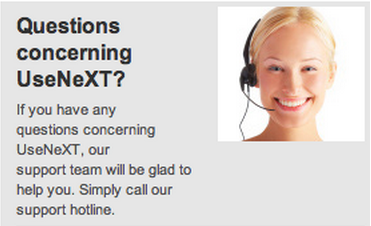 UseNeXT has many different outlets for support for their members. They have a big FAQ page that outlines common problems and troubleshooting. They also hold an online support through e-mail and a support hotline by phone during business hours.